In honor of International Day of the Girl, Women and Girls Lead – Kenya will offer girls and young women across Kenya an opportunity to connect with inspiring women leaders using the power of technology. On October 8th, 2015, the Women in the Red Awards will honor a group of 11 extraordinary women for leadership skills that are seldom recognized – skills such as peace-building, advocating for the marginalized and community service. During the awards, WGLG will be live streaming on OVEE, a platform that allows participants anywhere to chat live in a virtual theatre. Young women from partner organizations CARE, World Pulse and Internews have been invited to join the live chat to pose questions to the Awardees and other influential women from the media, technology and government sectors. Want to tune in? You can register here. 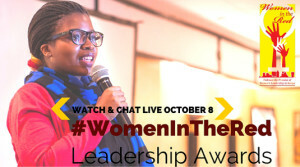 Watch live as the winners are announced, and join the conversation on women’s leadership in Kenya.